4. Click “Add” to move the “Search Conditions” section on the right hand side of the screen. 5. 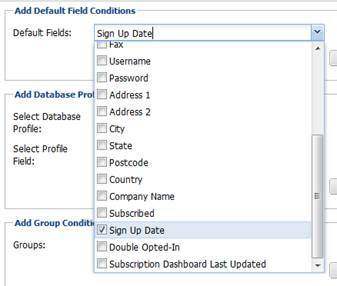 Remove “Email Address, Firstname & Surname” from the right hand side options so that only sign up date is listed. 6. Click on the dropdown list next to sign up date and select from one of the four options. In this example to search for users who signed up in June 2014. We will select “Between”. 7. Select the 1st and 30th of June and hit “Search”. 8. 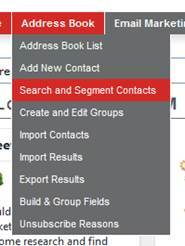 If you want to search for sign-ups based on GROUPS as well you will need to add the Groups from the “Add Group Conditions” option on the left into the “Search Conditions” on the right hand side.